Price: $0 $23.99 100.00% off i The regular prices might have a slight change due to amazon seller's control. ✔ 100% SAFETY MATERIAL: Was made by food grade material and 304 stainless steel, This product is nontoxic, BPA free, phthalate free, PVC free and lead free. solid and durable, easy to clean while resisting corrosion, rust, safe for you storage food. ✔ EAT HEALTHY AND FRESH: Our lunch box consists of two different parts, 304 stainless steel tray and lead-free plastic tray. The stainless steel tray is removeable, and what the great idea is you can put some hot water to the bottom tray for heating the food or some ice to fresh the food. This is the best tray for packing healthy food to go. ✔ FREE INSULATED LUNCH BOX COOLER BAG&CUTLERY INCLUDS: The insulated bag makes perfect thermal insulated & waterproof performance, keep food warm or cool at any time, safe, using reliable & durable material. Not only for bento box container, Also great for fruit, icecream. the cutlery set: spoon and fork just gives everything in &easy go life! ✔ MICROWAVE AND DISHWASHER-SAFE: Removable compartment plastic tray reheats food safely in the microwave and cleans up easily in the dishwasher (hand washing is recommended for the outer shell to preserve the leak-proof seal and extend the longevity of your product). ✔ GREAT SIZE FOR BOTH ADULTS AND KIDS: Our lunch box is featuring four compartments, two big and two small ones. The small storage containers are the perfect size for nutritious snacks and fruit! Kids and adults can use it for their favorite sides at lunchtime, Pack delicious food and reduce waste with this durable, hold-everything box. Cool design but could use improvement Pros: material feels nice and the looks is great the colors match too. I like the metal spooks and the bag that comes with it for insulation! Also metal tray is strong Cons: Bento box feels loose and the design flaw is basically that tray is metal, I get you can microwave the dish and put water into to heat it up but in the USA we don’t do that, everything revolves are a microwave and the description is very very confusing due to it saying it’s microwavable but is not due to metal. We don’t hear our food with heat water. I suggest you replace the metal tray with bamboo and to make yourself seem different keep the metal spoon and fork tho. Different colors would be nice and the design feels loose, it should be much more compact and strong feeling. Stainless lunch box It is well made and easy to wash. It is good for big kid, not younger one. Smaller than I expected Need to upgrade bag. 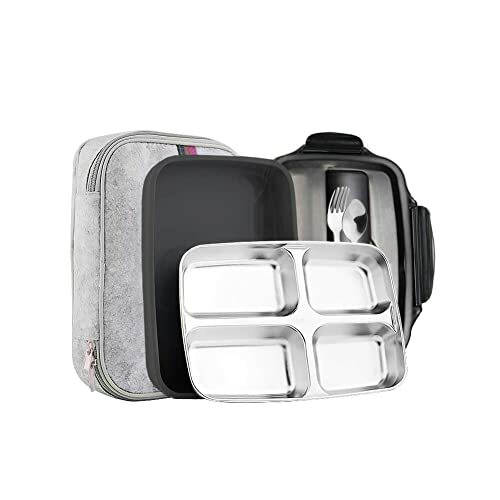 Hey,come to try Slim Stainless Steel Square Lunch Box Set Insulated Leak Proof Lunch Box for Adults and Kids Non-toxic Tasteless With Insulated Bag And Cutlery Dishwasher Microwave Safe (Black transparent lid) now.It's a trial rebates.